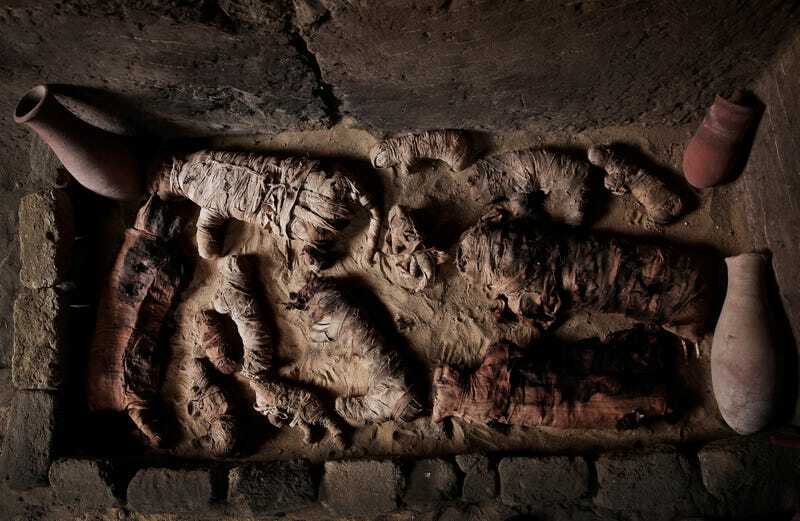 Mummified cats inside a tomb, at an ancient necropolis near Egypt’s famed pyramids in Saqqara, Giza, Egypt. Mummified scarabs found in the tomb. In all, seven Pharaonic Age tombs were discovered—three dating back to the New Kingdom (1550 BC to 1077 BC) and four dating back to the Old Kingdom (2686 BC to 2181 BC) of Ancient Egypt. Saqqara was once the Necropolis (or cemetery) of Memphis, the capital city of Egypt for more than 2,000 years. Antiquities minister Khaled el-Enany told reporters that three of the tombs were used for cats, as the Guardian reports. One of many wooden cat statues found in the tomb. Artifacts found in the ancient necropolis. Ministry officials said an apparent sealed tomb dating back to the Fifth Dynasty of the Old Kingdom (2500 BC to 2350 BC) was also discovered. Remarkably, its false door appears to be intact—suggesting its contents are undisturbed. This tomb will be explored by experts in the coming weeks, the Guardian reports. So, there’s more to come from this extraordinary necropolis!